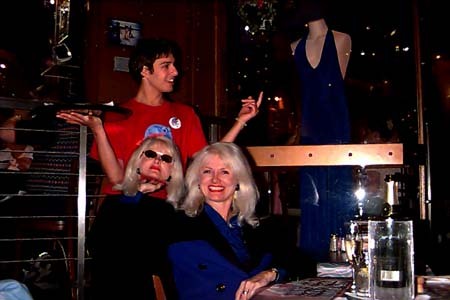 Here is an out take from "My Dinner with Andréa E Socí" where Andréa is trying to convince our waiter at some Hollywood restaurant to place her bust atop the mannequin's torso. until it does here's a quick look at my recent doings...in pictures. More Andréa E Socí at the office and on the town with Janet and I.
Roy Rogers and Norton Buffalo at a fine party thrown by Mimi Farinia. Working on a secret project with Apple Photographer John Greenleigh and Dr. Lewis C. Knapp. I am actually taking a class in Motorcycle Training.